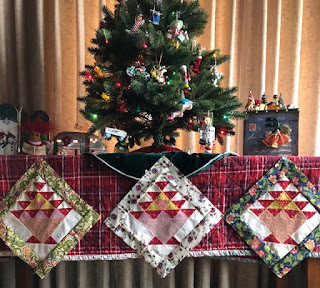 Here it is just a week from my 2019 Planning Party post about quilting goals, wishes and dreams and I am already altering my plans - that happens regularly in the Tami world. I had my eye on this lot of fabric on an auction site for awhile. It first posted at $30 with $20 to ship it. NOT worth a $50 price tag. As an aside, you really have to watch those shipping costs on auction, it could potentially cost you more than the actual item. When the price dropped to $20 with 1 cent shipping, those blocks were finally mine! That calculates out correctly, it is hard to tell how many completed blocks are in the lot, but I counted at least 6. Even at $3 a block, it is worth it. 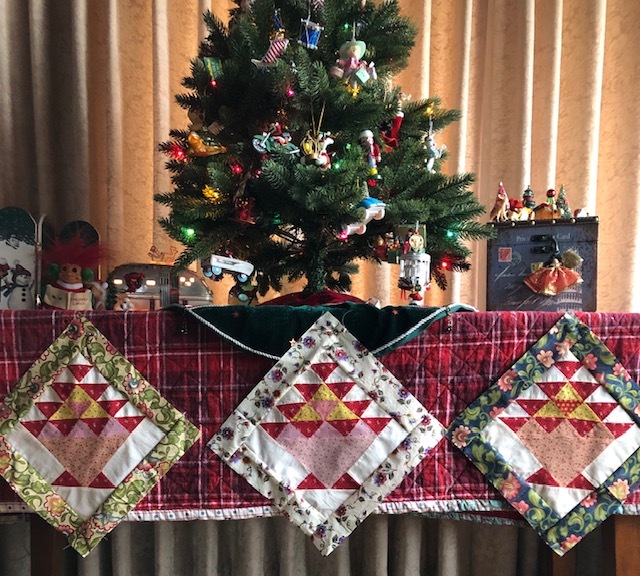 Call me a lazy piecer, but I love to take another quilter's work, whether it is partially completed blocks or pieces of patchwork, and incorporate them into a quilt. My box of goodness arrived on Christmas Eve. There are 36 basket blocks that were prewashed. I ironed them and squared up the blocks as best I could. Some measure 8" and some 7.5". Three of the bordered blocks are in my lead-off image, having bordered 10 on Christmas Day. I also found the CAMs for my White 3355 on another auction site. The seller didn't know what they had, and I am sure it is a pretty narrow market - those who purchase vintage sewing machine parts. I am debating on whether to donate my vintage sewing machines. I have two others, one a Singer and one a Morse. I get these babies oiled and running and then they still have issues, probably the reason they were sent to thrift in the first place. Each month I will post a number and that’s the project you should work on that month. On the first of the next month, I’ll post a new number and a link box where you can link up and share the progress you made on your UFO for the previous month. 10. 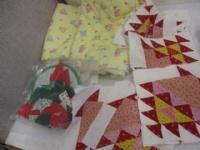 There will be at least one Art with Fabric blog hop quilt. 11. Another patchwork crazy creation utilizing satin pieces (link to wall quilt here). 12. Colorwash quilt. I did a fabric pull on this one but stalled on the design. I don't want to "bite off more than I can chew" on this project so it may be slow going. Finally, a new-to-me Instagrammer Sherry crazyquiltpatcher explained the difference in how people approach quilting. 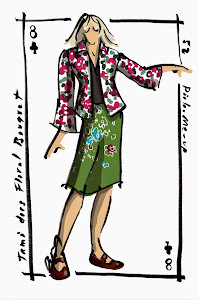 Years ago, I had a quilt teacher say there are two types of quilters: Process people and Project people. The Process people work on something until they have mastered the process and then a "squirrel" gets their attention and they are on to the next process. The Project people work on a project until it is completed. . . . they are able to avoid the charm of the "squirrels" until they get their project done. When I grow up I would love to be a Project person. . . . . . I'm just not sure that it will ever happen! I know I am happiest when I am hand binding a quilt for completion. May there be many finished projects in 2019!